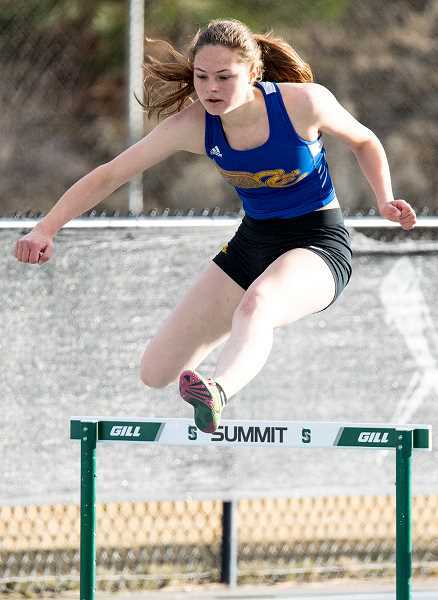 The Crook County High School track and field team did not run all of their top competitors in their normal events Wednesday in a three-way meet at Summit. Crook County was attempting to rest people to get ready for Saturday's Prefontaine Rotary Invitational in Coos Bay. As a result, Crook County did not do as well as they might have in the meet. However, the Cowboys were still second, ahead of Ridgeview, while the Cowgirls were third, just one point behind the Ravens. Summit easily won both the boys and girls meets. The Storm finished with 85 points in the boys competition compared to 49 for the Cowboys and 11 for Ridgeview, while the Storm girls scored 82 points, to 32 for Ridgeview and 31 for the Cowgirls. Despite not running at full strength, Crook County still had some outstanding performances. Perhaps the most notable was in the girls 100. Although the Cowgirls did not score any points in the event, it was still a major victory for senior Gracie Kasberger. Kasberger suffered a severe knee injury during soccer season and was expected to miss the remainder of the school year. She missed all of basketball season, while working hard to rehab her surgically repaired knee. Earlier this week, she was cleared to run, much earlier than expected. Although she only placed 10th, Kasberger was the first Cowgirl finisher, with a time of 14.12. An exhalant Kasberger spent much of the rest of the day celebrating as she not only ran well but did not have any pain following the race. Her time earned her a trip to Coos Bay on Saturday. Teammate Alyson Thomas finished 11th in the event but ran a personal record time in the process, sprinting to the finish line with a time of 14.16. Freshman Tienna Quinn also ran well, setting a personal record as she placed fifth in the 200 with a time of 28.94. The Cowgirls showed some depth in the 400, taking three of the top four places as well as sixth and seventh. Senior Mckinzee Mode was second overall with a time of 65.48. She was followed by sophomore Aubrey Love, who finished third in 66.37. Jan Carne, who normally runs distance, was fourth in 66.75, while Quinn finished in sixth, 69.37, and fellow freshman Sofia Langley was seventh in 69.48. The Cowgirls did not run anyone in the 800 but loaded up runners in the 1,500. Freshman McCall Woodward took second in the race with a time of 5:36.49. Sophomore Kelcie Ames was third overall with a time of 6:00.63, while freshman Grace Brooks punched her ticket to Coos Bay with a time of 6:20.39 in her first ever 1,500-meter race. The Cowgirls also had some good news in the 100 hurdles, where Emma Hehn came back from an early-season injury to finish third with a time of 18.28. Teammate Jenae Mapes was fifth in 18.55. Mode doubled back from the 400 to place third in the 300 hurdles with a time of 52.76, while Hehn was fourth in 53.95. The Cowgirls were a distant fourth in the 4x100 relay, however, still ran nearly a second faster than last Friday in Lake Oswego. Langley, Messina McClellan, Quin and Faith Wagner finished with a time of 54.71. The Cowgirls picked up their lone victory on the track in the 4x400 meter relay as Mode, Carne, Thomas and Love ran away from the field, taking first with a season-best time of 4:29.53. Teammates Hailey Coffman, Emily Mize, McCall Woodward and Lindsey Mode were third in 4:52.49. The Cowgirls picked up two more wins in the field events. Junior Kenna Woodward won the discus with a throw of 106-08 and finished second in the shot put with a heave of 33-01. Teammate Samantha Black was fourth in the discus with a toss of 92-00, while Marrisa Asher was fifth with a throw of 89-06. Asher also placed in the shot put, taking fourth with a season-best throw of 29-09.50. Shelby Squire finished second in the javelin with a toss of 100-00, while Josie Kasberger was sixth with a throw of 78-07. Wagner picked up an easy win in the pole vault, clearing 10-00 before electing to pass with jumps still remaining due to a stiff breeze. Leahlynn Cates was fifth in the event with a clearance of 7-00, while Love also cleared 7-00, but finished in seventh due to more misses. Cates also placed in the high jump, taking fifth with a season-best clearance of 4-06. The final Cowgirl to place was freshman Elise Rice, who took fifth in the triple jump with a personal-best leap of 28-04. Despite running people in different events than usual, the Cowboys still showed that they have some team depth. Cowboy runners finished second through fourth in the 100, with Zach Guthrie, a sophomore, taking second in 11.29, while senior Dominic Langley, who ran in a different heat, was third in 11.74, and freshman Triston Fischer was fourth in 11.97. Both Langley and Fischer ran career-best times. The Cowboys then finished fifth, sixth and seventh in the 200 as Austin Rochelle, Kaden Horton and Jacobey Hale all ran personal-record times. Rochelle finished fifth in 25.01, while Horton was sixth in 25.07, and Hale was seventh in 25.22. Alec Carne and Noah Chaney were the first two Cowboy finishers in the 400, taking fifth and sixth, respectively, with times of 55.57 and 55.59. Crook County stacked the 800 and took four of the top six places as a result. Alex Vail was the first Cowboy finisher as the sophomore took second in 2:13.59. Junior Eric Logan was third in 2:14.25, while senior Logan Tanner finished fourth in 2:15.75. Fellow senior Roman Stenbeck was close behind, taking sixth in 2:16.96. All four Cowboys had either personal-record or season-best times in the race. The top Cowboy in the 1,500 was junior Jeremy Cartlidge, who finished sixth with a time of 5:32.16. The Cowboys won their first event on the track in the 3,000, where senior Miles Chaney lapped nearly the entire field. Chaney won in a season-best time of 9:56.26, while teammate Wyatt Clifton, a sophomore, took third in 11:10.33. Crook County hurdlers finished fourth and fifth in the 110 highs as senior Elijah Becker finished fourth in a personal-record time of 17.29, and sophomore Trevyn Smith was fifth in 18.55. Smith and Becker reversed their order of finish in the 300 hurdles. Becker ran in the fast heat and finished sixth overall in 46.51, while Smith ran in the second heat, running away from the field in his heat to take third overall in 45.02. The Cowboys finished second in the 4x100 relay as Chaney, Fischer, Jason Slawter and Horton finished in 46.95. Then the Cowboys dominated the 4x400 relay with Carne, Langley, Fischer and Catterson finishing in a time of 3:35.1, nearly 20 seconds ahead of second-place Summit. The Cowboys really flexed their muscle in the throwing events. Senior Tyler Humeston won the shot put with a heave of 46-03, while fellow senior Caleb Parrott was fifth with a throw of 38-08.50. Parrot then won the discus with a toss of 126-10, while Humeston was third with a throw of 112-02, and junior Carson Chamness was fourth in 103-10. Humeston was also second in the javelin with a throw of 128-06, while sophomore Austin Rochelle was fifth with a throw of 116-09. Langley won the high jump with a leap of 5-10, while Fischer was fourth with a clearance of 5-00. Slawter took third in the pole vault with a leap of 10-00, while Deusce Catt was sixth with a clearance of 8-00. Guthrie placed second in the long jump with a leap of 20-05.50, while Horton was fourth, 17-06, Erik Gonzalaz fifth, 17-04, and Smith sixth, 17-03. Langley then leaped a personal-record distance of 42-01.50 to finish second in the triple jump, while E.J. Allen was third with a jump of 37-11. Crook County leaves Friday for the Prefontaine Classic, which begins with field events starting at 10 a.m. on Saturday. The meet, which is one of the largest in the state, is something that Crook County looks forward to each year. The team often posts some of their best times of the year at the meet, which is held at Marshfield High School. 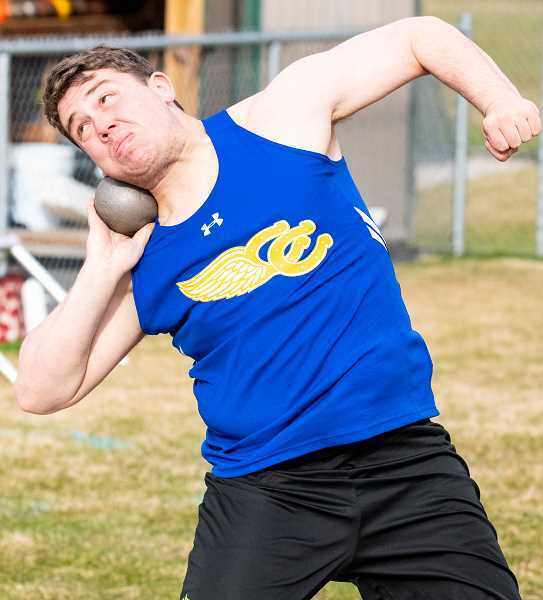 Following Saturday's meet, Crook County has a three-way meet on Wednesday, April 17 at Hood River Valley, with The Dalles also competing. The team then wraps up a busy week with the Summit Invitational on Saturday, April 20. 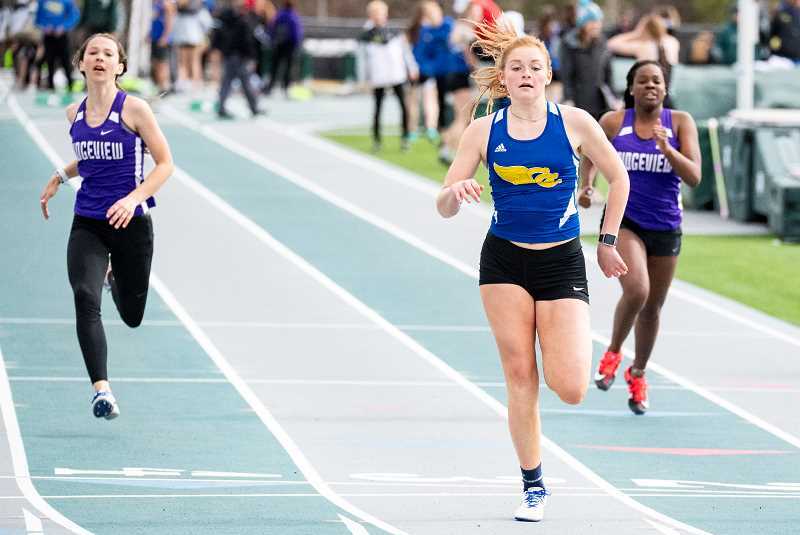 The meet is expected to attract 32 teams and approximately 1,200 individual athletes as many of the top Class 6A teams in the state are expected to attend. Boys team scores — 1. Summit, 85. 2. 2. Crook County 49. 3. Ridgeview 11. Girls team scores — 1. Summit, 82. 2. Ridgeivew, 32. 3. Crook County, 31. 200 Meters Varsity — 1. Dylan Lambert, Summit, 23.02. 2. Robert J Gorman, Summit, 23.57. 3. Calvin Kolar, Summit, 24.18. 4. Austin McVey, Ridgeview, 24.95. 5. Austin Rochelle, Crook County, 25.01. 6. Kaden Horton, Crook County, 25.07. 7. Jacobey Hale, Crook County, 25.22. 9. Dakoda Robedeau, Crook County, 25.42. 11. Nathaniel Littrell, Crook County, 26.28. 18. Deusce Catt, Crook County, 28.46. 19. Cameron Bruce, Crook County, 28.69. 20. Kyree Willis, Crook County, 28.75. 21. Jacob Moon, Crook County, 29.35. 400 Meters Varsity — 1. Simon Kidder, Summit, 52.64. 2. Calvin Kolar, Summit, 53.85. 3. Kaden Brickey, Summit, 54.69. 4. Kian Bangerter, Ridgeview, 54.92. 5. Alec Carne, Crook County, 55.57. 6. Noah Chaney, Crook County, 55.59. 8. Kaden Horton, Crook County, 56.74. 9. Jason Slawter, Crook County, 57.28. 11. Cade Catterson, Crook County, 58.46. 16. Dakoda Robedeau, Crook County, 61.39. 17. Jacobey Hale, Crook County, 64.7. 20. Isaac Logan, Crook County, 72.19. 800 Meters Varsity — 1. Kaden Barker, Summit, 2:10.9. 2. Alex Vail, Crook County, 2:13.6. 3. Eric Logan, Crook County, 2:14.2. 4. Logan Tanner, Crook County, 2:15.8. 6. Roman Stenbeck, Crook County, 2:17.0. 9. Hunter Eller, Crook County, 3:05.0. 1500 Meters Varsity — 1. Austin Johnson, Ridgeview, 4:57.5. 2. John Deaver, Summit, 5:02.1. 3. Ethan Peters, Ridgeview, 5:03.9. 4. Dasan Simmons, Summit, 5:04.5. 6. Jeremy Cartlidge, Crook County, 5:32.2. 7. Jordan Graydon, Crook County, 5:38.1. 8. Rian Heiges, Crook County, 5:38.5. 9. Jonah Bainbridge, Crook County, 5:47.5. 3000 Meters Varsity — 1. Miles Chaney, Crook County, 9:56.3. 2. Ethan Peteres, Ridgeview, 10:30.5. 3. Wyatt Clifton, Crook County, 11:10.3. 110m Hurdles - 39" Varsity — 1. Robert J Gorman, Summit, 15.62. 2. Ty Zuber, Summit, 16.13. 3. Jackson Clough, Summit, 17.23. 4. Elijah Becker, Crook County, 17.29. 5. Trevyn Smith, Crook County, 18.55. 10. Braydon Olsen, Crook County, 22.36. 300m Hurdles - 36" Varsity — 1. Ty Zuber, Summit, 41.98. 2. Simon Kidder, Summit, 42.31. 3. Trevyn Smith, Crook County, 45.02. 4. Jackson Clough, Summit, 45.03. 6. Elijah Becker, Crook County, 46.51. 4x100 relay — 1. Summit, 44.55. 2. Noah Chaney, Triston Fischer, Jason Slawter, Kaden Horton, Crook County, 46.95. 3. Ridgeview, 48.35. 4. Summit B, 48.98. 4x400 relay — 1. Triston Fischer, Alec CArne, Cade Catterson, Dominic Langley, Crook County, 3:35.11. 2. Summit, 3:54.24. 3. Ridgeview, 3:54.63. 4. Miles Chaney, Hunter Eller, Trevyn Smith, Jordan Graydon, Crook County B, 4:02.18. 5. Alex Vail, Roman Stenbeck, Kevin Arroyo, Wyatt Clifton, Crook County C, 4:17.11. Shot Put - 12lb Varsity — 1. Tyler Humeston, Crook County, 46-03.00. 2. Chuck Sheldon, Ridgeview, 41-11.00. 3. Hunter Jackson, Summit, 39-02.00. 4. Juan Baza, Ridgeview, 38-09.50. 5. Caleb Parrott, Crook County, 38-08.50. 7. EJ Allen, Crook County, 36-06.50. 8. Carson Chamness, Crook County, 35-11.00. 9. Lonnie Belz, Crook County, 35-00.50. 10. Erik Gonzalaz, Crook County, 34-03.50. 12. Hayden Hilderbrand, Crook County, 30-08.00. 14. Wyatt Holiday, Crook County, 29-03.00. 14. Riley Aikins, Crook County, 29-03.00. 16. Malachi Mullins, Crook County, 27-10.50. 18. Azariah Becker, Crook County, 25-05.00. 19. Caleb Phay, Crook County, 25-00.00. 20. Austin Strong, Crook County, 24-11.50. 21. Jose Villagomez, Crook County, 22-00.00. Discus - 1.6kg Varsity — 1. Caleb Parrott, Crook County, 126-10. 2. Chance Settlemier-Caruso, Summit, 115-10. 3. Tyler Humeston, Crook County, 112-02. 4. Carson Chamness, Crook County, 103-10. 8. Lonnie Belz, Crook County, 89-01. 10. Riley Aikins, Crook County, 86-05. 11. Hayden Hilderbrand, Crook County, 81-09. 13. Wyatt Holiday, Crook County, 77-04. 16. Malachi Mullins, Crook County, 71-11. 17. Azariah Becker, Crook County, 71-07. 18. Austin Strong, Crook County, 69-00. 19. Jose Villagomez, Crook County, 58-11. Javelin - 800g Varsity — 1. Milo Mora, Summit, 129-10. 2. Tyler Humeston, Crook County, 128-06. 3. Jackson Buresh, Summit, 126-05. 4. Chance Settlemier-Caruso, Summit, 117-07. 5. Austin Rochelle, Crook County, 116-09. 9. Austin Strong, Crook County, 105-05. 14. Hayden Hilderbrand, Crook County, 87-04. 15. Rian Heiges, Crook County, 84-05. 19. Riley Aikins, Crook County, 79-11. 20. Azariah Becker, Crook County, 76-02. 21. Isaac Logan, Crook County, 76-01. 2. Malachi Mullins, Crook County, 74-03. 23. Lonnie Belz, Crook County, 73-10. 24. Jeremy Cartlidge, Crook County, 67-11. 25. Daniel Olsen, Crook County, 61-03. 26. Wyatt Holiday, Crook County, 51-00. 27. Carson Chamness, Crook County, 49-00. 28. Jose Villagomez, Crook County, 31-10. High Jump Varsity— 1. Dominic Langley, Crook County, 5-10.00. 2. Owen Kendall, Summit, 5-04.00. 3. Brendon Colella, Ridgeview, 5-04.00. 4. Triston Fischer, Crook County, 5-00.00. 7. Austin Rochelle, Crook County, 5-00.00. 8. Kyree Willis, Crook County, 4-08.00. 9. Nathaniel Littrell, Crook County, 4-06.00. Pole Vault Varsity — 1. Forrest Franklin, Summit, 12-00.00. 2. Nathan Fairbanks, Summit, 11-00.00. 3. Jason Slawter, Crook County, 10-00.00. 4	. Ryan Wood, Summit, 9-00.00. 6. Deusce Catt, Crook County, 8-00.00. 7. Isaac Logan, Crook County, 8-00.00. 8. Nathaniel Littrell, Crook County, 8-00.00. 10. Azariah Becker, Crook County, 7-00.00. Long Jump Varsity — 1. Jack Normand, Summit, 21-06.00. 2. Zachary Guthrie, Crook County, 20-05.50. 3. Campbell Smith. Summit, 19-07.50. 4. Kaden Horton, Crook County, 17-06.00. 5. Erik Gonzalaz, Crook County, 17-04.00. 6. Trevyn Smith, Crook County, 17-03.00. 8. EJ Allen, Crook County, 17-02.00. 10. Elijah Becke, Crook County, 16-11.00. 17. Dakoda Robedeau, Crook County, 14-10.00. 21. Jacob Moon, Crook County, 14-03.00. 22. Jody Talimalo, Crook County, 14-01.00. 24. Isaac Logan, Crook County, 13-01.50. 25. Kyree Willis, Crook County, 12-10.00. 27. Cameron Bruce, Crook County, 12-00.00. Triple Jump Varsity — 1. Jack Normand, Summit, 44-02.75. 2. Dominic Langley, Crook County, 42-01.50. 3. EJ Allen, Crook County, 37-11.00. 4. Kaden Brickey, Summit, 35-05.25. 100 Meters Varsity — 1. Morgan Hanson, Summit, 13.06. 2. Ana Gonzalez, Ridgeview, 13.15. 3. Caroline Schutz, Summit, 13.21. 4. Camille Buzzas, Summit, 13.26. 10. Gracie Kasberger, Crook County, 14.12. 11. Alyson Thomas, Crook County, 14.16. 14. Dallase Hutchins, Crook County, 14.4. 17. Lauren Papke, Crook County, 14.74. 20. Faith Wagner, Crook County, 14.78. 21. Jacey Allen, Crook County, 14.82. 28. Kendall Maycut, Crook County, 15.3. 29. Shelby Squire, Crook County, 15.33. 32. Hailey Coffman, Crook County, 15.43. 200 Meters Varsity —1. Caroline Schutz, Summit, 26.92. 2. Camille Buzzas, Summit, 27.28. 3. Taitem Jensen, Ridgeview, 27.43. 4. Ana Gonzalez, Ridgeview, 27.56. 5. Tienna Quinn, Crook County, 28.94. 7. Aubrey Love, Crook County, 29.42. 8. Alyson Thomas, Crook County, 29.58. 11. Messina McClellan, Crook County, 29.89. 14. Hailey Coffman, Crook County, 30.82. 17. Lauren Papke, Crook County, 31.11. 400 Meters Varsity — 1. Morgan Hanson, Summit, 63.13. 2. Mckinzee Mode, Crook County, 65.48. 3. Aubrey Love, Crook County, 66.37. 4. Jeanette Carne, Crook County, 66.75. 6. Tienna Quinn, Crook County, 69.37. 7. Sofia Langley, Crook County, 69.48. 800 Meters Varsity — 1. Jorun Downing, Summit, 2:31.0. 2. Cristina Farfan, Ridgeview, 2:46.2. 3. Hannah Kohler, Ridgeview, 3:01.2. 4. Emma Ausfahl, Summit, 3:02.6. 1500 Meters Varsity — 1. Ruby Gates, Ridgeview, 5:31.8. 2. McCall Woodward, Crook County, 5:36.5. 3. Kelcie Ames, Crook County, 6:00.6. 4. Isabella Moore, Summit, 6:02.7. 6. Grace Brooks, Crook County, 6:20.4. 7. Hannah Dozhier, Crook County, 6:26.7. 8. Marli McClellan, Crook County, 6:29.7. 9. Emily Mize, Crook County, 6:31.9. 10. Sammy Thornton, Crook County, 8:49.6. 3000 Meters Varsity—1. Magdalene Williams, Summit, 11:08.4. 2. Jane Whitticar, Ridgeview, 12:55.5. 3. Jessica Whitticar, Ridgeview, 13:04.2. 4. Megan Lasala, Summit. 13:34.7. 100m Hurdles - 33" Varsity — 1. Katie Leavitt, Ridgeview, 17.02. 2. Jocelyn Parks, Summit, 17.17. 3. Emma Hehn, Crook County, 18.28. 4. Jenna Albrecht, Ridgeview, 18.46. 5. Jenae Mapes, Crook County, 18.55. 7. Messina McClellan, Crook County, 19.51. 9. Elise Rice, Crook County, 20.33. 12. Emmah Barnes, Crook County, 21.77. 300m Hurdles - 30" Varsity — 1. Jocelyn Parks, Summit, 51.01. 2. Sarah Tebbs, Ridgeview, 52.4. 3. Mckinzee Mode, Crook County, 52.76. 4. Emma Hehn, Crook County, 53.95. 7. Messina McClellan, Crook County, 54.42. 9. Jenae Mapes, Crook County, 54.78. 10. Emmah Barnes, Crook County, 56.3. 4x100 Relay Varsity — 1. Summit, 51.38. 2. Ridgeview, 51.77. 3. Summit, 54.46. 4. Sofia Langley, Messina McClellan, Tiena Quinn, Faith Wagner, Crook County, 54.71. 6. Emmah Barnes, Kendall Maycut, Lauren Papke, Jenae Mapes, Crook County, 57.5. 4x400 Relay Varsity — 1. Mckinzee Mode, Jeanette Carne, Alyson Thomas, Aubrey Love, Crook County, 4:29.5. 2./ Summit, 4:46.0. 3. Hailey Coffman, Emily Mize, McCall Woodward, Lindsey Mode, Crook County, 4:52.5. Shot Put - 4kg Varsity — 1. Kitt Rupar, Summit, 34-07.50. 2. Kenna Woodward, Crook County, 33-01.50. 3. Paige Gordon, Summit, 30-05.50. 4. Marrisa Asher, Crook County, 29-09.50. 8. Josie Kasberger, Crook County, 26-00.50. 9. Leahlynn Cates, Crook County, 25-04.50. 10. Patsy Wagner, Crook County, 24-06.00. 11. Shelby Squire, Crook County, 23-08.50. 13. Heather Ptomey, Crook County, 22-11.50. 16. Jiselle Gish, Crook County, 18-11.50. 17. Sammy Thornton, Crook County, 18-08.00. 18, Marah Binder, Crook County, 18-05.50. 19. Abbigail Chaney, Crook County. 16-01.00. 20. Samantha Black, Crook County, 6-06.50. Discus - 1kg Varsity — 1. Kenna Woodward, Crook County, 106-08. 2. Paige Gordon, Summit, 101-11. 3. Kitt Rupar, Summit, 97-08. 4. Samantha Black, Crook County, 92-00. 5. Marrisa Asher, Crook County, 89-06. 7. Grace Brooks, Crook County, 68-08. 9. Lauren Papke, Crook County, 68-00. 10. Shelby Squire, Crook County, 67-05. 11. Josie Kasberger, Crook County, 64-03. 13. Patsy Wagner, Crook County, 61-04. 16. Jiselle Gish, Crook County, 54-01. 17. Abbigail Chaney, Crook County, 45-08. 18. Heather Ptomey, Crook County, 45-02. Javelin - 600g Varsity — 1. Paige Gordon, Summit, 106-04. 2. Shelby Squire, Crook County, 100-00. 3. Jenna Albrecht, Ridgeview, 88-08. 6. Josie Kasberger, Crook County, 78-07. 7. Leahlynn Cates, Crook County, 77-01. 10. Kenna Woodward, Crook County, 70-10. 11. Samantha Black, Crook County, 70-03. 14. Heather Ptomey, Crook County, 61-03. 15. Grace Brooks, Crook County, 57-05. 16. Jiselle Gish, Crook County, 53-04. 17. Marrisa Asher, Crook County, 51-11. 18. Patsy Wagner, Crook County, 48-04. 19. Abbigail Chaney, Crook County, 39-06. High Jump Varsity — 1. Jenna Albrecht, Ridgeview, 4-10.00. 2. Harper Justema, Summit, 4-08.00. 2. Allyson Hartney, Summit, 4-08.00. 4. Molly Burks, Ridgeview, 4-08.00. 5. Leahlynn Cates, Crook County, 4-06.00. 9. Hailey Coffman, Crook County, 4-04.00. 9. Kendall Maycut, Crook County, 4-04.00. Pole Vault Varsity — 1. Faith Wagner, Crook County, 10-00.00. 2. Elizabeth Verheyden, Summit, 9-06.00. 3. Leah Pfeiffer, Summit, 9-00.00. 4. Alexys Endries, Summit, 7-06.00. 5. Leahlynn Cates, Crook County, 7-00.00. 7. Aubrey Love, Crook County, 7-00.00. 10. Abbigail Chaney, Crook County, 6-00.00. Long Jump Varsity — 1. Birdie Wieche, Summit, 15-00.25. 2. Emma Brooks, Summit, 14-03.25. 3. Kayla Cowgill, Ridgeview, 14-02.25. 4. Ava McDonald-Carry, Summit, 13-08.25. 8. Tienna Quinn, Crook County, 12-06.25. 9. Elise Rice, Crook County, 12-05.25. 10. Kendall Maycut, Crook County, 12-01.50. 13. Marli McClellan, Crook County, 11-03.25. 14. Sofia Langley, Crook County, 10-08.50. Triple Jump Varsity— 1. Emma Brooks, Summit, 33-01.75. 2. Birdie Wieche, Summit, 32-02.50. 3. Caroline Schutz, Summit, 30-11.00. 4. Ava McDonald-Carry, Summit, 29-05.75. 5. Elise Rice, Crook County, 28-04.00. 7. Marli McClellan, Crook County, 24-07.25.